How Will Your Church Participate in #WorldRefugeeSunday on June 18 & 25? Over 65 million people have been forced to flee their homes in what has become the biggest refugee crisis that the world has ever known. Today, 1 in every 113 people worldwide are forcibly displaced, the majority of whom are women and children. The World Evangelical Alliance (WEA) calls on churches to observe World Refugee Sunday this coming June 18 or 25 and participate in prayer and action, responding in practical ways to God’s call to ‘love the stranger as yourself.’ Using the hashtags #WorldRefugeeSunday and #RefugeeHighway, churches can share about their activities on social media and inspire others to join. Information, resources and useful links are now available at refugeehighway.net/world-refugee-sunday, and more resources will be added in the coming weeks. “God has given us a mandate to love the alien as we love ourselves (Leviticus 19:34). I am encouraged to see a growing number of churches worldwide leaning into this divine calling to actively seeking the welfare of refugees by offering both practical assistance and a supportive community,” said Tom Albinson, WEA Ambassador for Refugees and Displaced People. “God has always called His people to be a blessing to the nations. The Church is now facing a great opportunity to do just that. In the same way God used refugees to be a blessing to others, including Joseph, Moses, Ruth, David, Esther, Nehemiah, Daniel, Jesus, Philip, and others, the Church will find blessing as we seek the welfare of strangers today,” he added. 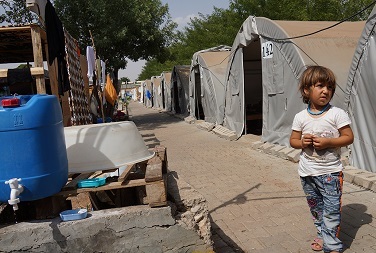 Commissioner Christine MacMillan, WEA’s Associate Secretary General for Public Engagement who heads up WEA’s Refugee Task Force, challenges churches and believers to also reflect on a refugee’s situation on a personal level. She said: "We as Christians are often overheard to be saying: "I go to church." Finding ourselves in church on World Refugee Sunday, may have us contemplating ‘church going’ as only a starting point. When some 65 million people wake up every day, what would we overhear them saying? Factors indicate their experience could be summarized as: "I am going further away from my home as place, security and community.” So where do our journeys intercept? For too many their journeys are unending and so for the Church may a named Sunday become an unending determination to welcome strangers as friends coming home." Share with us what you and your church are doing on World Refugee Sunday 2017 using the hashtags #WorldRefugeeSunday and #RefugeeHighway!